I was drafted in 1967 after two years of college, eligible because I was not in the upper half of my freshman class. I spent my junior year abroad at the University of Hue. 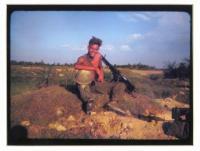 I went into the field with the 1st Cav. Air-mobile, line infantry, on January 1, 1968, and fought at Bong Son, Hue, Route 1-A (which the French had called the Street Without Joy), Khe Sanh, the Mini Tet at Cua Viet, the National Preserve west of Hue, and the A Shau Valley. I participated in about 150 air assaults in three hundred days and came out of the field on Thanksgiving Day, 1968. 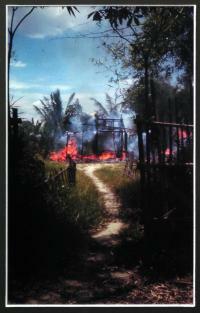 My photo of the burning village was taken during the Tet Offensive. Because I was involved in constant tactical movement I never stayed in one place very long, but I saw the diversity of both the terrain and the cultures in Vietnam. The burning village represents the destruction of both in the spring and summer of 1968.